Kate McKenzie and Hirra Farooqi recently took part in The Secret Marathon in the Beach. A local marathon held recently in the Beach supported International Women’s Day. 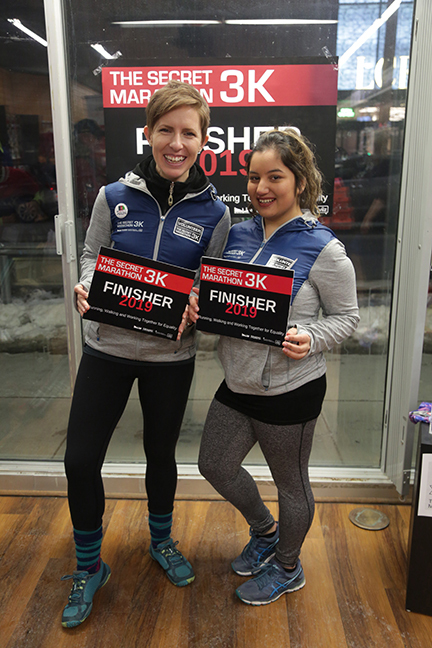 The Secret Marathon 3K run/walk took place on Wednesday, March 6 at 6:30 p.m. With the help of two organizations, the Running Room and Canadian Women for Women in Afghanistan, the idea of the marathon was launched. A total of 75 people participated in the event, and many others participated in 16 host cities across Canada. The marathon was able to raise over $12,000 for Canadian Women for Women in Afghanistan. For every $300, the charity is able to help a young Afghan girl go to school for a year. Kate McKenzie was inspired to create the event after filming a documentary in Afghanistan about the country’s first official marathon. She then partnered with Martin Parnell to help make a difference in Canada for those who didn’t feel safe to go for a run or walk at night. In a recent press release, McKenzie explained the support she witnessed and wanted to share after filming her documentary. “In Afghanistan we witnessed something really special,” McKenzie said. The event was named after the documentary about the Marathon of Afghanistan where the route is kept secret to avoid violent attacks. In recognition of that, the exact location and route of the 3K marathon in the Beach was kept secret until just before the event began. One of the Race Directors for the event was 21-year-old Hirra Farooqi. After being born in Afghanistan and growing up in Pakistan then Canada, Farooqi faced a few barriers over the years. These barriers existed mostly for being a woman. Although she faced some cultural barriers, she found her most prominent struggle existed in her everyday activities. Farooqi explained that she grew up playing cricket, but soon realized that it was a male-dominated sport. When she first attended Ryerson University, she became concerned that there was no women’s cricket team available. This inspired her to create the first ever women’s cricket team at the university, where she now serves as captain for 22 other girls. After meeting McKenzie and hearing the stories from her travels, Farooqi recognized and related to the struggles these women faced in their lives. “Having that experience where you have to overcome those kinds of boundaries in a sport, especially as a woman – and a marginalized woman on top of that – meant that I resonated with the stories from these women,” Farooqi said. She also added that being a part of such an event and seeing the community’s support was something very special to her. “It just meant a lot to me that people wanted to stand in solidarity for women and support them and give them all that they could to make sure they could run as well,” Farooqi said. Another participant was Beaches-East York Councillor Brad Bradford, who served as the Race Official for the event. Refreshments for this second annual 3K marathon run were donated by David’s Tea and Cobs Bakery. More information on the event can be found at www.thesecretmarathon.com/3krace.